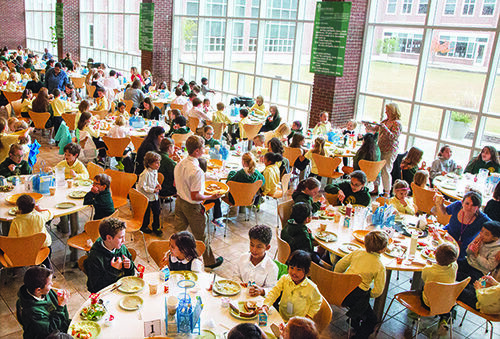 Family Style Dining in Lower School is an integral part of Saint Patrick’s mission to educate the whole child. Each round table includes a faculty or staff member who acts as the table's host and eight students from various grade levels which fosters relationship building between our youngest Wolfhounds and their older counterparts. Assigned tables dine together for nine weeks before switching to a new table for the next nine week period. By the end of a school year, students have the opportunity to foster relationships with many new school mates and faculty. This family style dining design helps students see that they are not only part of a small classroom community, but also one member of a family of 400. Additionally, lunchtime is an opportunity to teach invaluable social skills. The meal begins with a blessing after which the table’s host serves the meal family-style. Each student takes a turn in there role of server, assisting the table host and serving his or her table mates. The adult models manners and courtesy, facilitates conversation, and guides students toward healthy eating choices. The older students at the table learn that they too are role models. Students work together to clear the table. At the end of the meal, birthdays are celebrated, guests are introduced, and the gathering closes in prayer.